Not to sound like an alarmist, but your desk could be killing you – and your business. In the United States, an estimated 75 to 80 percent suffer from lower back pains due primarily to our sedentary, sitting-saturated lives. All that discomfort adds up to a roughly US$ 100 billion price tag each year, which is well over half of the US$ 170 billion businesses spend on occupational illnesses and injuries. That’s not the sexiest headline, so when CNN ran the story, they went with something a bit more on the nose – “Sitting will kill you, even if you exercise.” Among other things, the study found that “prolonged sitting,” meaning eight to 12 hours a day, can lead to increased rates of heart disease, cancer and chronic health conditions such as type 2 diabetes. For anyone who makes their living and lives their life at a desk, those are startling facts. Here’s how to defend yourself. Turns out your mom was right. Good posture matters. 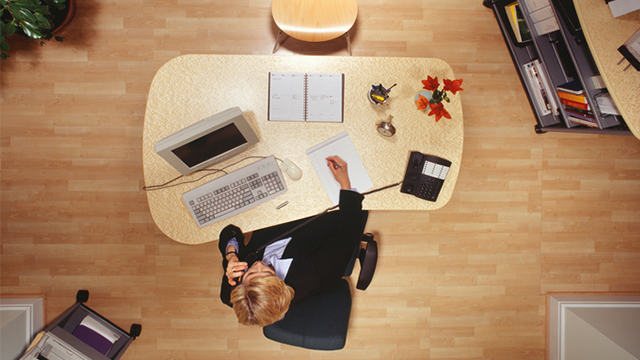 Hunching over your desk, with your back curved forward, puts undue stress on your upper back, lower back and neck. This stress comes primarily from misaligning the height of your desk and chair. At the risk of being obvious, human beings were not built to stare into harsh, poorly lit screens for eight to 10 hours a day. Add to that the one to two hours on average we spend away from work also staring at screens – our phones, tablets, laptops and televisions – and one conclusion stares back; our eyes are suffering. The best way to preserve your eyes is to take regular breaks from your screen throughout the day – even if they’re as short as 30 seconds – and to avoid all screens during breaks or lunch. Also, you can “stretch” your eye muscles by looking up and into the distance. Go outside when you’re eye stretching. Natural light helps immensely, as does getting FL-41 tinted glass for your glasses themselves. At the very least, it’s likely causing serious problems like back pain, neck pain, eye pain and general musculoskeletal issues. To defend yourself, follow the simple advice above. It could be the best investment you’ll ever make for your business. And it might just save your life.